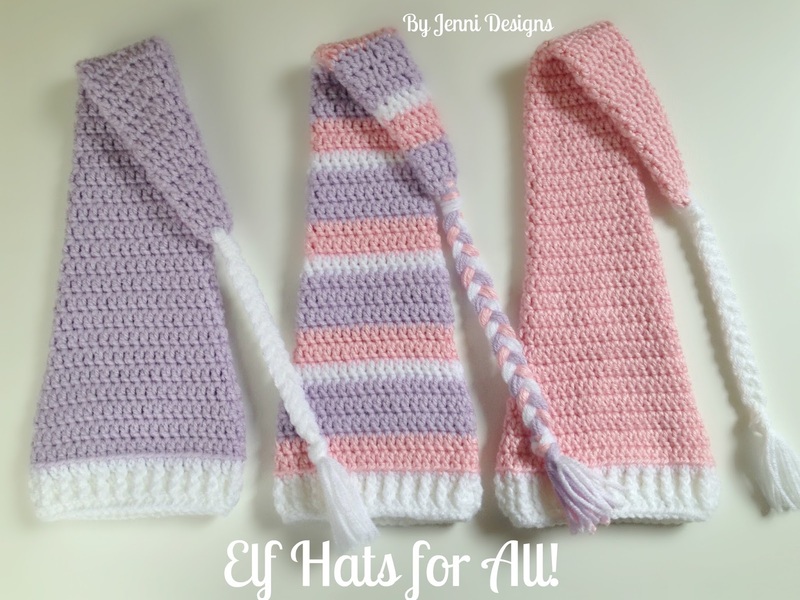 By Jenni Designs: Free Crochet Pattern: Elf Hat's for all! Hi, I love this pattern. I find that most elf hat patterns decrees too quickly and I love how gradual this one is. Do you give permission to sell the finished product or..? Thanks Shainah! Yes, you may sell any finished products you've made from my patterns. Sorry having problems with the pattern youth and preteens. . 2-29. Then do you do additional 24 rows??? Then go to row 30? Yes, that is correct Tiffany! Love this psttern. Thank you so much. You're welcome & thank you also! Sorry Jasmine, there is currently not a video for this pattern. Can you tell me what size you are trying to make? If you are making the newborn size you'll need to skip down below the instructions for the additional rows in this pattern. I hope this helps! Hmm...each row from rows 2-29 should only have one increase, maybe you have more? How many stitches do you have in your last row? You're welcome, I'm so glad it's working out for you! :) Thanks for letting me know!